Early this year, at a White House event, Trump had said he was satisfied with the Indian decision to reduce the import tariff on Harley-Davidson motorcycles from 100% to 50%. Describing India as a “very-high tariff nation”, US President Donald Trump has told his supporters he wants a “reciprocal tax” or at least “some kind of tax” on goods entering America. “India is a very high-tariff nation. They charge us a lot,” the president said, amidst a temporary truce between the US and China over tariffs. In his speech, Trump touched a wide range of issues, including domestic, global and bilateral relationship with countries like India. 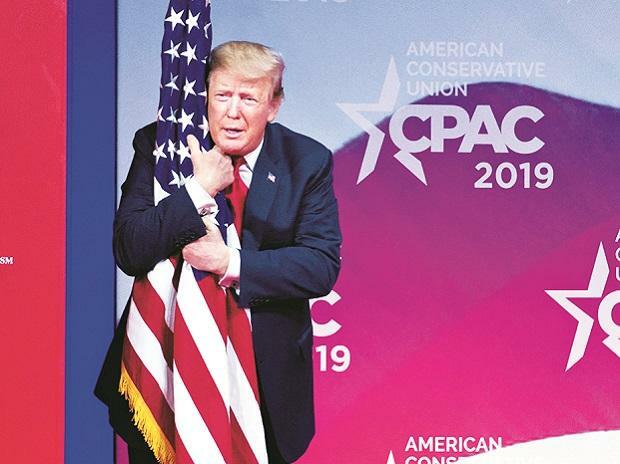 In his address to the Conservative Political Action Conference (CPAC) in the Maryland suburb of Washington DC on Saturday that lasted over two hours, the longest in his presidency, Trump also lashed out at his detractors in a wide-ranging speech. Earlier this year, at a White House event to announce his support for reciprocal tax, Trump had said he was satisfied with the Indian decision to reduce the import tariff on Harley-Davidson motorcycles from 100 per cent to 50 per cent. “Even this is not enough, this is okay,” he had said. “Look at motorcycles as an example. (In) India, it was 100 per cent. I got them down to 50 per cent, just by talking for about two minutes. It’s still 50 per cent vs 2.4 per cent (on imported motorcycles to the US). Again, other than that, it’s a very fair deal,” he said on January 24. On Saturday, he used the Indian example of how other countries were imposing high taxes on American products and now it was time for the US to impose a reciprocal tax. “So, they charge a hundred. So I say, I’m not going to charge you a hundred, but I’m going to charge 25 per cent, and I hear this turmoil in the Senate because we are charging 25 per cent,” he said. “I say, fellows, listen, they are charging us a 100 per cent. For the exact same product, I want to charge them 25 per cent. I feel so foolish charging 25, because it should be a 100. But I’m doing 25 only because of you. I want to get your support,” he said. Thereafter, Trump mimicked the response from the lawmakers. “Sir, that’s not free trade. Where did these people come from? Where do they come from? I need your help, I need your help, the voters’ help. Where do they come from?” he said. “For one thing, they don’t respect us. They think we’re stupid. They don’t respect us. But let me tell you something, the world respects our country again. America is now booming like never before. Other countries are doing very poorly,” Trump said. The CPAC is an annual political conference attended by conservatives and elected officials from across the country.